Most of the people start thinking about saving tax in the month of January. As there are plenty of tax saving instruments available in the market, here we would tell you why Equity Linked Savings Scheme (ELSS) or tax saving/planning mutual fund schemes are the best tax saving option for you. Let’s Understand the top 5 reasons to invest in ELSS. Equity-linked savings schemes, commonly known as ELSS, are mutual funds that primarily invest in equities. ELSS offer higher returns due to investments in the equity market, along with dual tax benefits under Section 80C of the Income Tax Act. Under Section 80C of the Income Tax Act, 1961, you can invest up to Rs. 1,50,000 in ELSS to claim deductions on Income Tax. Apart from this, you get tax-free capital gains and dividends up to Rs1,00,000 annually (as proposed in Budget FY19) for investments held over a year. For long-term capital gains (LTCG) over Rs1-lakh, you need to pay 10% tax. If you fall in the 20-30% tax slab, you can end up saving a good amount every year by investing in ELSS. All tax saving investments typically come with a mandatory lock-in period. When you compare the lock-in of instruments under Section 80C, you’ll see that the popular PPF has a lock-in of 15 years, NPS is locked-in until you’re 60, others have lock-ins of 5+ years, but ELSS has a lock-in of just 3 years! Read: ELSS vs. PPF vs. ULIP: Which is a better tax Saving Instrument for 2019? ELSS or tax-saving mutual funds invest primarily in the equity markets and thus have the potential to deliver market linked returns. ELSS has proved to give returns of 14-16% annually, especially on long-term investments. This would help one achieve their financial goals and create wealth at the same time. You can start investing in ELSS funds with a minimum amount of Rs. 500. There is no maximum limit. This way you can invest in smaller amounts while gaining the benefits of ELSS. SIPs (Systematic Investment Plans) help invest pre-decided amounts every month with discipline. Since there’s a lock-in period of 3 years, if you start a SIP in Equity Linked Saving Schemes, the returns for your SIP amounts will be generated every month after 3 years of the first investment. The mutual fund universe is large. There are many ELSS funds to choose from, each offering a diverse portfolio of stocks. You are not limited by just one scheme or plan. Taxation reduces a considerable part of the income and in order to ensure maximum benefits from any investment, one must always look for tax-efficient investment instruments. Under Section 80C of the Income Tax Act, the government allows an exemption on investment in various schemes and individuals can claim tax deductions of up to Rs 1.5 lakh on such investments. Three such schemes are the Public Provident Fund (PPF), Equity Linked Savings Scheme (ELSS) and Unit Linked Insurance Policies (ULIP). Equity-linked savings schemes (ELSS) and unit-linked insurance policies (ULIP) are long-term investment products that are aimed at providing equity returns along with tax benefits. ULIPs also offer insurance benefits along with market returns and tax advantages. PPF is more like a voluntary EPF scheme that the government started to encourage residents to save for their retirement. PPF is a debt product issued by the post office. Equity Linked Savings Schemes or ELSS is another type of a Mutual Fund which offers tax exemption under section 80C of the Income Tax Act. These Schemes Invest in the majority of their corpus in Equity Market. Since the returns from such schemes are market-linked, the performance of these funds depends on the stock market and individual stock holdings in a particular ELSS. Tax Exemption up to 1.5Laks under section 80c of Income Tax Act. Investments in ULIPs are eligible for tax deductions u/s 80C and the maturity fund value will also be tax-free provided the sum assured (SA) of the policy is more than 10 times of the annual premium. If SA is less than 10 times of annual premium, no tax benefits will be available. However, death benefits are tax-free in the hands of a nominee, even if the death occurred before completion of five years from the date of purchase of the eligible ULIP policy. Can invest in Debt or Equity, depending upon your risk appetite. Public Provident Fund Scheme or PPF is a long-term investment instrument introduced by the government to encourage savings for providing security to people in old age. Any resident Indian citizen can open a PPF account. PPF account can be opened for minors also with either of the parents or a legal guardian jointly. Low Returns, as the Investments are made in Debentures. Conclusion: Debt yields are falling consistently and PPF rates change on a quarterly basis. Of course, PPF returns will also be revised upwards with rising in interest rates but that is a remote possibility with inflation at such low levels. The power of compounding works perfectly in case of ELSS and ULIP. In case of PPF, with 8% annual rate of return, your long-term wealth creation is restricted. Between ELSS and ULIP, ELSS is better as because of low Lock-in Period and Low Expense Ratio. Here is the Cambridge definition of the word ‘Procrastination’ – To keep delaying something that must be done, often because it is unpleasant or boring. The definition highlights two important aspects – 1. The thing which is being procrastinated is important 2. The thing which is being procrastinated can be boring. Let’s dwell upon financial procrastination. Now the investment decisions can be boring for someone; however, they can be interesting for some other. However; I am sure you would agree that the Financial Decisions are necessarily important for all of us. The fact is; in the list of things which are highly procrastinated; Investment decisions would be among top few. • Imagine you haven’t bought a Health Insurance and a family member is hospitalized due to some medical emergency. You would rather liquidate your investments and pay the hospital bills. This can eat out your savings of last 3-4 years and you may have to start saving all over again. • Delay in regular savings can have a large impact on your assets in the long term. Here is an example of a delay in starting a SIP. Suppose you start a SIP of Rs 10000 per month, the rate of interest is 12% and the investment period is 20 years – the total amount accumulated at the end of 20 years will be 98,33,075. However, in case you delay this SIP by 8 months then the with all equations remaining same the amount accumulated will be Rs 90,10,450. This means the delay of just 8 months in starting a SIP of Rs 10000 can cost you approx. Rs 8 Lakhs. • Not buying Term Insurance or not making a ‘Will’ can have a lot of mental trauma in case the bread earner dies. The family can be in huge financial crises. Not making a ‘Will’ can have an impact of asset distribution to the legal heirs. • Not getting the Financial Planning done in time can have a substantial impact on the amount required at the time of the goals like education of children or your retirement. • Simple things not keeping the important documents well organized can cause a lot of time loss. • Sometimes procrastination is a habit. Sometimes it is because the decision or the tasks are not attractive enough to be performed immediately. You have to constantly train yourself that the boring decision and tasks are good in the long run. So you have to complete the boring tasks first and then the exciting ones. • Most of the times the times required of taking these important financial decisions or completing the financial tasks is very small. However, the time spent just on thinking about completing the tasks can be substantially high. Constantly instruct yourself that by spending a small time (in taking an important financial decision or in completing the important financial task) you will get benefited in a big way. • Prepare a Checklist of Important Financial Decisions and Important Financial Tasks. Share this list with your spouse. Both of you together should accomplishment of each task in the list. Financial Planning is nothing but changing the way of living. By taking a small step you can pave a way towards a bright tomorrow. Do write your feedback in the comments below. It is said that you need to experience certain things to understand them thoroughly. Any office is one such place where certain things are inevitable. With an office comes discipline, skills of the staff working there, equipment in an office, office ambiance, processes etc. An office works efficiently by having all the above things in place. Results of any activity are profound with the help of all the above parameters. 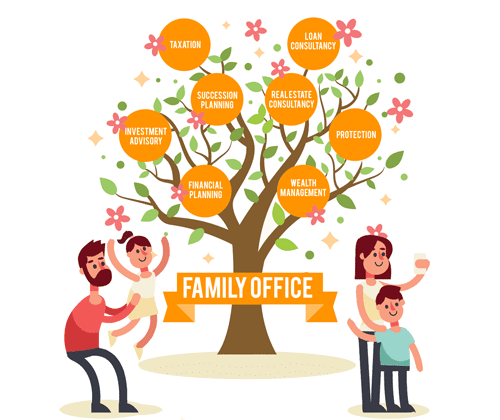 Our personal lives (usually) have no scope for an Office to be a part of it to handle the matters related to the family. 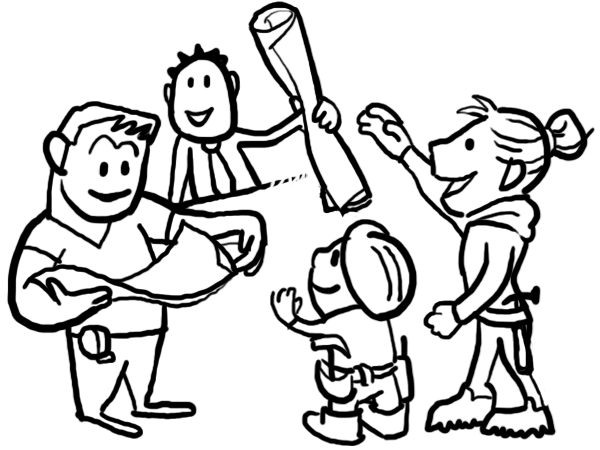 Decisions relating to family matters are supposed to be taken by family members together. These decisions can be about the marriage of a family member, about an important thing to be purchased, about the major decisions in business, about court matters, or it can be about money and investments, or there can be some more to this list. All these major decisions are taken by the members of the family by discussing the topic with each other thoroughly. As we are progressing, with the advent of technology, the day to day living is becoming easy. We have all modern amenities ready to serve us. But with this progressive life, has some curse with it. 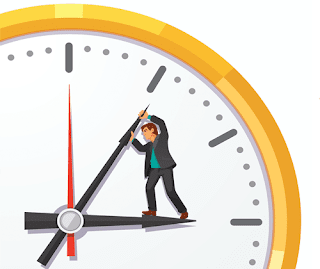 Most of us are not finding enough time for personal and family activities from our daily professional routine. The family members are not able to get together to discuss important family issues. If a family or the member of that family has free time for the family matters, they lack the expertise to decide and execute important decisions. Though the internet has made all the information readily available to us, it is very difficult to separate right and wrong information. There is a lot of misleading information available on the web. So, this information may not always be useful to take the right decision. A family is not expected to be a disciplined entity like an Office. You can’t expect family members to deal professionally with each other. It also means that family members may not be able to professionally decide on family matters without being emotional about the task at hand. This probably requires someone else who is not emotionally attached to the task at hand and who is skilled enough in the matter. This brings us to one point – there may be the need of one such entity which can take care of the family matters, decisions that are professional, unbiased, without any emotions into it and involving the skills. Here is the solution. Those families which are finding it difficult to manage their Personal Finance and related activities can look forward to a Family Office to- plan, manage and execute all such important practical tasks. The tasks liked Financial Planning, Wealth Management, Succession planning, Insurance planning, Accounting, Debt (loan) Management are interrelated. 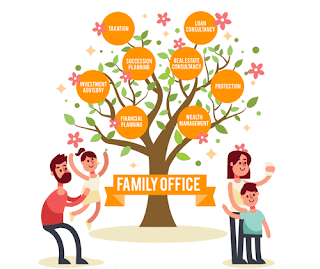 But if the Family Office is not in place, the family has to deal with a different office (and different person) for each of the above services. It is obvious that any family would not find it convenient in dealing with all these offices separately. So basically, Family Office is an entity that provides together, the services of an Investment Advisor, Financial Planner, Accountant, Lawyer, Insurance Advisor etc. Though the concept of Family office is relatively new in India, it is being offered in many cities, especially in Metros. However, most of these family offices serve only to Ultra HNI Families. These Family Offices working for Ultra HNI families focus prominently on Investment part of it. They usually advise families on non-traditional investment alternatives such as Private Equity, Start-Up funding, Alternate Investment Funds and so on. When a Family Office service is provided to more than one family it is called as Multi-Family Office. If a Family Office provides service only to one (Very Wealthy) Family it is called as Single-Family Office. Single Family Office needs is affordable only to a few who’s who in the country. In some cases of Ultra HNI Families; the family themselves manage the Family Office. They recruit skilled staff for managing their Family Office. The point is; does only Ultra HNI and HNI clients need these services which are provided by a Family Office. Or Higher middle Class and Middle Class may also need these services? The fact is; every family small or big; HNI or middle-class, needs these services. The issues is not many such service providers (Family Offices) are available today. Especially Tier 2 cities are missing these services big time. He being a friend of mine, I had a fair idea of his finances. Still, we together decided to go ahead with the process as led down by my firm. So, we entered into an agreement and signed the Letter of Engagement. I handed him the Financial Planning Questionnaire. He and his wife, who by qualification was a Chartered Accountant, though not practicing. Both of them completed the questionnaire religiously and handed back to me. o He had erratic Cash Flow. No discipline here. o Most assets were in Real Estate and Chit Funds. One important thing which we have noticed is that he mostly used to work for builders. There were instances when builders offered him a Flat/s in their schemes against his fees. The cost of flats was higher than the fees he was supposed to receive. Now, this friend of mine had outstanding to be paid to the builders. Moreover, he had a large amount of fees to be recovered from his clients and this trend was sharply growing. For us this was a clear case of money indiscipline. We have chalked out of definite ‘plan of action’ to change his basic habits. His wife being an accountant, things went quite smoothly. Clear the dues outstanding to be paid for the flats he has already booked. This was adjusted against the fees outstanding in the market. It’s been 3 years since we have worked on his Financial Plan. When we started his liquid investment portfolio was worth Rs 4.44 L. We could create an Investment portfolio consisting of 70% Mutual Fund (70% allocation to all type of Mutual Funds put together) + Stocks (10% allocation) + other (20% allocation)- Real Estate excluded. The portfolio sized to Rs 82 Lakhs without accounting for the growth in the portfolio. We had could generate total 82 lakhs now channelized to the right Assets and each investment properly assigned to a goal. He is insured properly. Most importantly he has peace of mind. He is now nicely placed in terms of his liquidity. He has started earning better returns on his investments. We kept of reviewing his financial plan and his investment portfolio for life changes during this period. This has paid off well. Ironically, now my architect friend no more wants to invest in real estate. After long I am writing on Nifty. 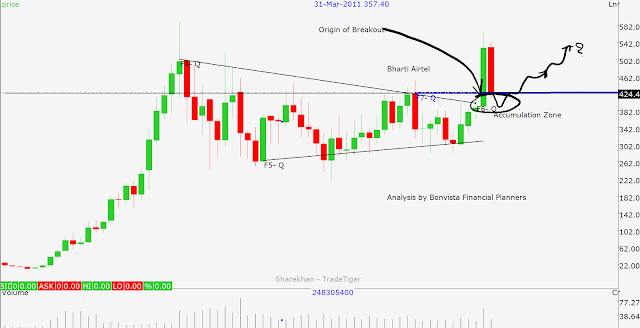 There is a reason to do so - Nifty breaks medium term up-trend. 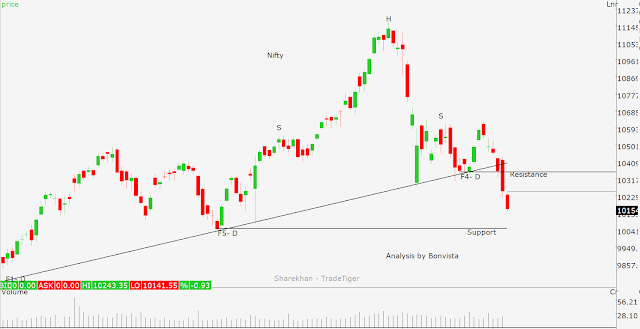 Nifty breaks below trend line as well as Head & Shoulder neckline. As you can see in the daily chart below, the breakdown has come about with good volumes. Bears have a clear edge over bulls. Nifty is approaching the next support between 10100-10040. So it would not be wise to short at this moment. One can expect a bounce from the support. If the bounce comes about, Nifty can move up to its resistance near 10300-10350. 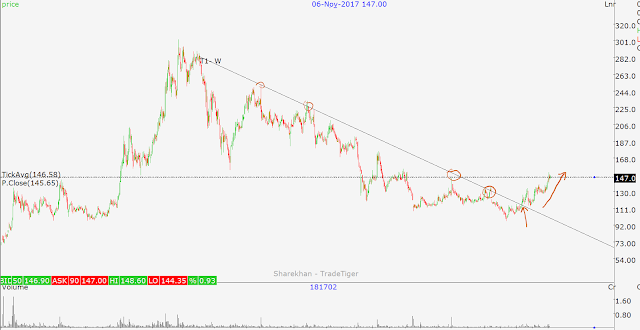 With this movement, we can assume that Nifty is in medium-term downtrend. The same is also confirmed by the cycle change from 'higher top higher bottom' to a new cycle of 'lower top lower bottom'. The new cycle of lower top lower bottom is expected to continue for some time now. If Nifty breaks below 10040, next major support is near 9750. First picture below is a Quarterly Candlestick chart. I love using Monthly and quarterly charts. They give a clear picture at a larger scale. Once we get this helicopter view, we understand what is happening and what can be expected in the times to come. 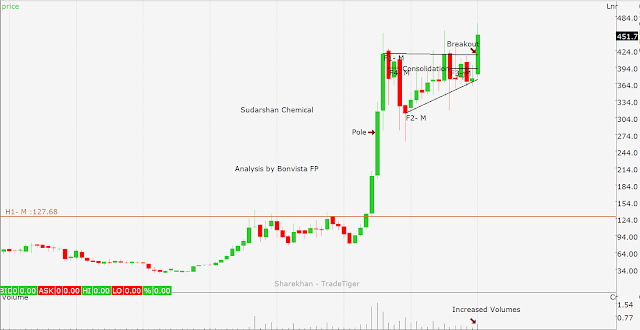 You can see below that the stock has formed a long triangle beginning in Jan 2007 and since then was trading in the consolidation till Sep 2017. Since the period is too long and the chart we are considering here is a quarterly chart, the low and high of the consolidation too is large. 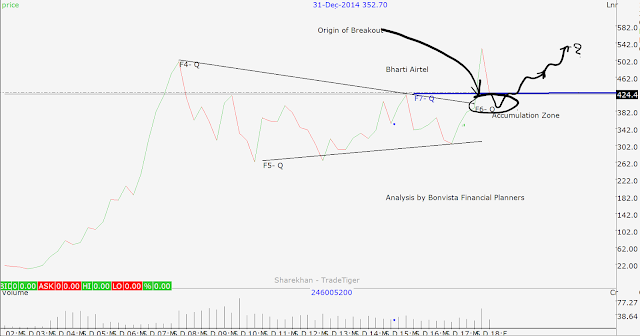 The base of this consolidation is around 260 and the top is around 500. The triangle went narrow during the quarter ended Sep 17. Finally the stock broke out of the consolidation in Oct 17. You can see on the chart when the quarter in ended Dec 17 formed, a huge green candle supported by increased volumes. I have also produced a Line Chart below to understand the picture more clearly. Current markets pressures have brought the stock back to its breakout levels of around 425, where the stock is currently trading. 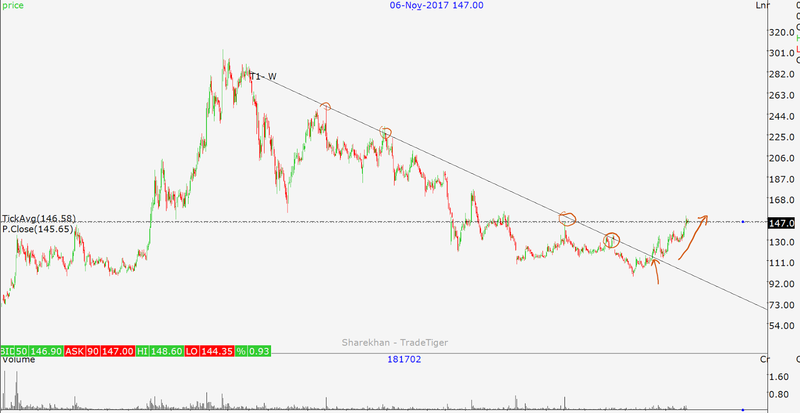 The stock after breaking out has corrected to test the level of breakout, as it usually happens in most breakout examples. This is an entry opportunity. 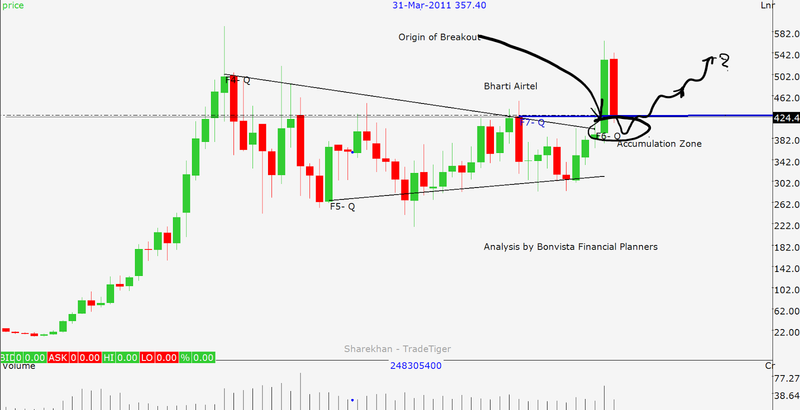 I have produced a weekly chart below which is showing the origin of breakout and how it is currently trading near the same level after a fall of around 20%. This fall brought the stock back to its support near 424 which also the origin of the breakout. We have experienced that this is an opportunity to accumulate the stock. This zone is between 424 to low of around 380. 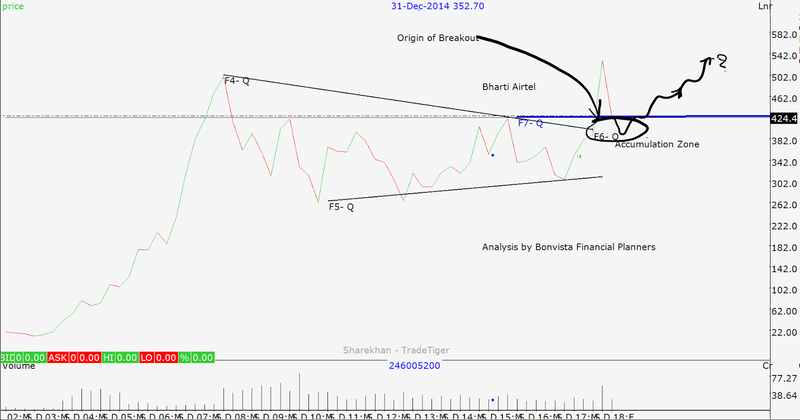 If the stock fails to sustain above 380, we may consider failure of the pattern. Remember that the patterns can fail, not usually though. The stock has a potential to move from this level and the gains can be handsome. 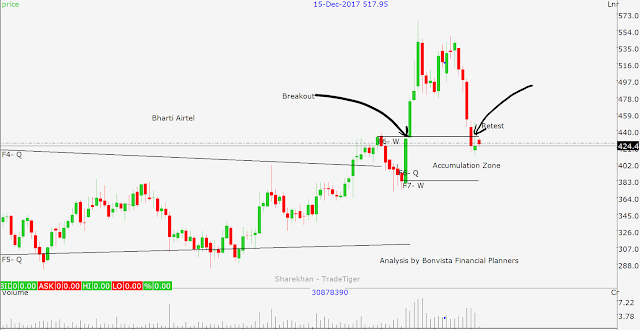 Though we can not predict the targets we believe that the stock can achieve first possible level of 530 and then 650 and then 840.